If the default map options have not enough detail for your project or you would like to create a tour showing an indoor area, you can use the 'Custom Maps' tour upgrade. With this tour upgrade, you can upload 2D images as custom maps for your tour. At the bottom of the map frame shown on the right, you will see the “Map” and “Earth” thumbnails. As this feature is only available for the tours with the purchased 'Custom map' tour upgrade, on this stage system checks if your tour has this tour upgrade applied. If you haven't unlocked 'Custom maps' feature for the tour, you can do it right away. Just click the button to purchase the tour upgrade or use one you have on your account. You can check the number of tour upgrades available and purchase tour upgrades in advance in the 'Upgrades' section of your Roundme account settings by this link. Once the feature is successfully unlocked and your custom map is saved, it is available in the map section of your tour next to the default map options. Now you may want to locate all the other panoramas on the custom map. Please note that your panorama can have only one location set. Make sure that your panorama is not located on one of the other maps and delete the previously set location if needed. 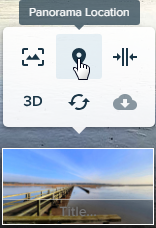 (you can find some more information about setting and deleting the panorama location here). You can upload more than one custom map to your tour. It could be useful if your tour shows a multistorey building or includes several distant locations.